It‘s a long time ago that we have reviewed the last cookbook here on Deborahs Bücherhimmel. Unfortunately we had so much to do, but now we are proud to present you a premiere: Our first cookbook review in English. The last weeks we‘ve cooked dishes from different cookbooks in english. 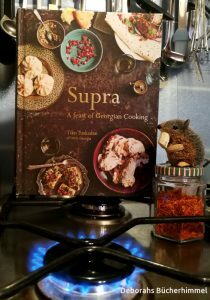 Let‘s start with a review from a cookbook we‘ve purchased last year during the Frankfurt book fair: „Supra“ from Tiko Tuskadze. We‘ve tested two (or at least three) dishes, as we always do when we cook for reviews. Due to the fact that we‘ve purchased the original english version we have to translate the recipes and ingredients first. The recipes are clearly understandable and easy to cook. The only challenge here in Germany was to find suppliers for the special spices, e.g. marigold. I‘ve found special online spice shops in the US and the UK, but not in Germany. Georgia is a country located in the Caucasus region, at the crossroads of Western Asia and Eastern Europe, bounded to the west by the Black Sea, to the north by Russia, to the south by Turkey and Armenia, and to the southeast by Azerbaijan. First we should explain what a georgian „Supra“ is. A „Supra“ is an integral part of the georgian culture. It‘s a feast with lots of different dishes on the table and everybody can fill their dish with anything they want. The recipes in the book are portioned for 4 to 8 people. For the two of us we picked out only single dishes which made us happy for two or more days. 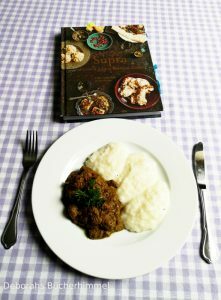 The cookbook „Supra – A feast of Georgian cooking“ is seperated in 9 chapters (salads, soups, meat, fish …). So you are able to choose your own „Supra“ with different dishes. Tiko Tuskadze, the author of this book, is the owner of the restaurant „Little Georgia“ in Islington, a district not far away of the City of London. I‘m sure you can imagine how we would like to enjoy the taste of the dishes directly served there. You will need a little more time to prepare this dish, mainly for the cooking time. The ingredients were easy to find, except for the marigold. We used saffron instead. The list of ingredients is relatively short and the preparation is easy. You should start with the porridge because he requires a bit more time to cook (1¾ hours). The beef demands approx. 65 minutes. And, we like to cook beef a little bit longer. The taste will be more intense then. On the day after we warmed it up … and it tasted better than the day before. For us the taste of walnut, garlic, coriander, cinnamon, nutmeg and grounded cloves, bay leaves and marigold (saffron) was completely unfamiliar. But combined with the porridge it was really nom nom. As usual we left out one ingredient: fresh coriander. We don‘t like his taste. We used parsley instead. This dish will not win the 1st price for the best looking dish, but it was so flavourful. If you don‘t have a 6 person household or planning a party we recommend you to prepare only the half portion of the porridge. We‘ve prepared the indicated lot of the stew and enjoyed this delicious taste more than one day. You can also freeze it easily to prepare it again on another day. The idea to prepare this dish popped up as we purchased some corn-fed chicken breast at our local butcher‘s. It was not that juicy as prepared with a whole chicken but it was time winning instead. Using the chicken breast it needs less time for preparing and cooking. The more we eat it the more we got used to the touch of cinnamon in our meat dishes. Cinnamon is almost indispensable in our kitchen. 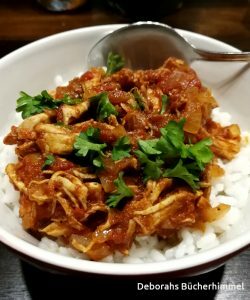 The chicken stew from Tiko Tuskadze is simple to prepare, but so flavourful, it‘s a personal tipp for a cooking rookie. During the time the chicken cooks in the pot you can easily prepare the rest of the dish. Cut the onions and stew them in a large pan, and add the other ingredients (3 tins of chopped tomatoes, tomato paste, cinnamon, grounded cloves, plenty of garlic …). Shread the chicken meat with your hands and add into the pan together with the other ingredients. 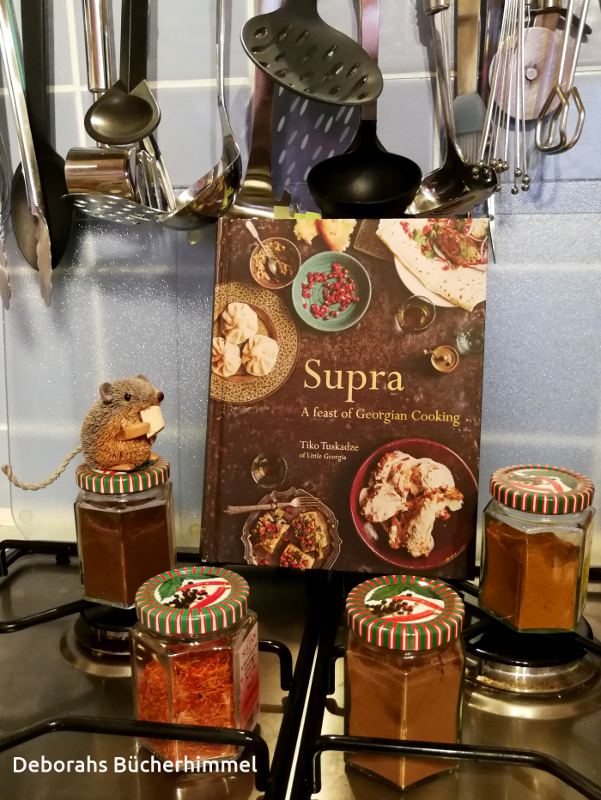 All thumbs up for „Supra – A feast of Georgian Cooking“. This was one of our best purchases ever. It will gives us great pleasure trying out the other dishes. Until now we are not disappointed and the unusual spice mixtures leads us to new flavourful experiences. We are eager to try out new things (besides of sea-food and fresh coriander). After translating the ingredients it was easy to follow the cooking instructions, also easy to understand and to prepare. The pictures of the prepared dishes are appealing, the setting of the pictures are calculatedly simple, simply like the meals are served at home, sometimes with a bit rustic and country-styled charme. This year Georgia is the partner country of the Frankfurt book fair. Please keep your fingers crossed that we will have the chance to taste some georgian food and wine there. 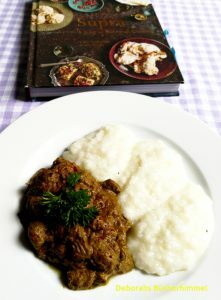 We recommend this cookbook if you are interested in georgian (or eastern europe) food. And if you are planning a visit to London, Tiko Tuskadze will be happy to welcome you at „Little Georgia“ in Islington.